Travel back in time with champion fingerstyle guitarist John Standefer as he revisits his early years, rekindling the spark that inspired him to spend a lifetime playing guitar. 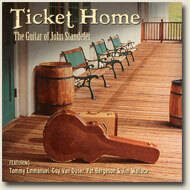 Coming from musical parents, John first carried on the family tradition by playing mandolin and fiddle. During the 'folk' era of the early '60s, he began fingerpicking a guitar along with Peter, Paul & Mary. Then he discovered the genius of Chet Atkins. Chet's magical way of arranging an entire orchestration for solo guitar fueled John to become one of the finest fingerstyle guitarists in the world today. Join John Standefer as he shares the beauty and essence of the music that started it all.